New Castalloy workers Martin Parker, Edward Fern and Michael Tamasi celebrate the news. I blogged back in December 2011 (HERE) that Harley-Davidson made a decision to shift wheel and hub manufacturing from Adelaide-based New Castalloy to China. The plant was set for closure by mid-2013. This news hit the Australian Workers Union State Secretary and union workers just prior to the Christmas holiday and resulted in some name calling and bad blood with the motor company. Jump ahead a 1.5 years and New Castalloy had shed approximately 90 of the 212 workers, but there was some good news this week! Harley-Davidson reversed the decision to shutter the plant and struck a 4-year deal, on both an extension to the plant’s lease and a new wage-agreement were obtained. It would seem logical to assume that New Castalloy greatly improved its cost structure as they are now viewed as competitive at producing low-volume, high finish wheels. The Australian government, which owns the Mooringe Ave. plant waived rent at the site to help secure the deal. Congrats! I’m sure the nice folks in Adaelaid feel good knowing they’ll continue to help H-D riders around the world express their own style of freedom. Photo courtesy of Dylan Coker. “It’s disgraceful, but how about the heartless timing for Christ’s sake.” — Australian Workers Union State Secretary Wayne Hanson said to reporters. 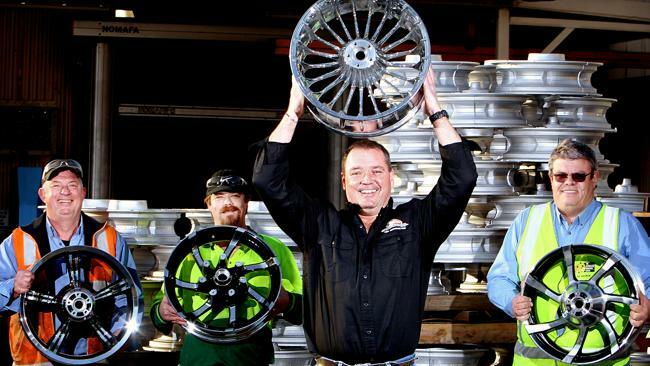 It’s not well known, but the majority of cast wheels and hubs for Harley-Davidson motorcycles are produced in Australia and shipped to Milwaukee. 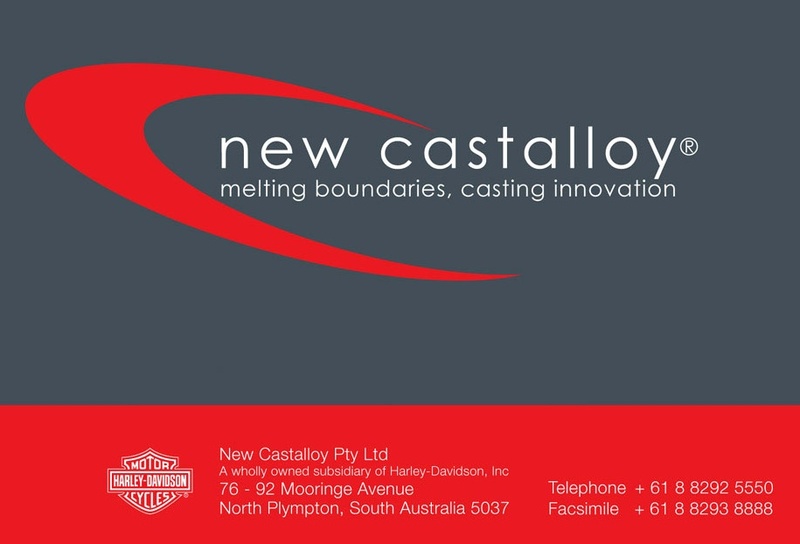 Harley acquired Adelaide-based New Castalloy in 2006 when continuity of wheel supply was an issue. The Australian subsidiary is New Castalloy and was a long-time supplier that was on the verge of bankruptcy of its then parent company, Ion. Now Harley-Davidson plans to shift the manufacturing to China (according to South Australian Trade Minister Tom Koutsantonis) where it will save the motor company about $9 million a year. The decision to cease operations at New Castalloy will effect 183 employees and 29 contract workers. Harley expects to complete the transition to “outsourcers” by mid 2013. The company estimated the related restructuring costs at $30 million, of which $10 million will be recorded in 2011 and $20 million in 2012. South Australian Trade Minister Tom Koutsantonis said to reporters, “To tell a group of workers before Christmas they may not have a job is insensitive and I think quite silly.” Mr Koutsantonis also stated that the motor company had given no indication to the government of the closure and as a result were unable to provide any assistance. The South Australian Employment Minister Tom Kenyon stated that workers would get between $3K – $5K each in job training, but he was rather candid in that there was no place for them once we’ve got them through the right training. As we know and have read many times, Harley has been recreating itself as a premium brand and smaller manufacturer while trying to grow its market share outside the U.S.
Made cheaper in China might be the new corporate mantra and correct decision based on pure Wall Street math, but there can’t be much pride in that choice. Every time a U.S. President wants to demonstrate the benefits of free-trade, they hold up poster child Harley-Davidson, who was yanked from the Japanese jaws of death and a shrine for the ever faithful. Today was no exception as Bush stumped on global trade and discussed how it “mostly helps” American workers during his speech on the Columbian Trade Agreement. The Wisconsin 6th District Congressman Petri was in attendance because he believes that Harley’s are a product that people around the world ought to be able to drive by making it more affordable. In his second year serving on the Bush appointed International Trade Advisory Board, Harley’s CEO Jim Ziemer must be feeling pretty special that his company is sharing the international presence spotlight! All of this is like a perfect storm…Harley announced plans to reach out to customer groups that were not its traditional fans – women, young people, and minorities along with a shift from “pull” to “push” marketing. I would anticipate that South America has just as many mid-life testosterone driven, on their 3rd marriage buyers as the U.S. so why not push a policy of price parity? 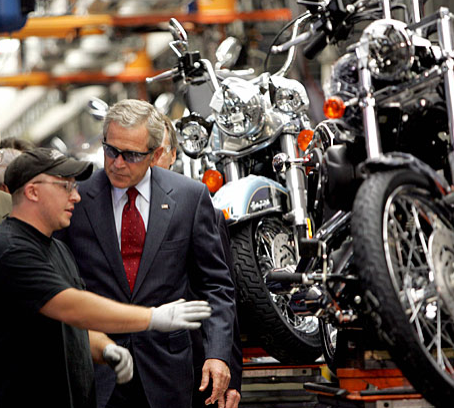 Bush touring York, PA plant courtesy of USA Today – Eileen Blaas.